いらっしゃいませ！ Welcome to our store ! All items are 100% authentic, licensed merchandise from Japan. bring you the best stuff straight from Japan, happy times!! Asakura-Japan.com is an online shop based in the Japan that sells goods of Studio Ghibli and Pokemon, Japanese snacks, Japanese accessories, figures and much much more. All items are 100% licensed, authorized merchandise bought directly in Japan at the Pokemon Center or other licensed dealers. 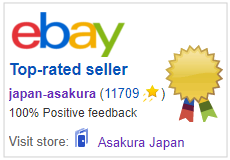 Asakura-Japan.com is a privately owned company and is not affiliated in any way with Nintendo, Pokemon Center, Studio Ghibli. Our goal is to bring you the best stuff straight from Japan, happy times.